Eating papaya is among the most satisfying of life's simple pleasures. Prepared in a variety of different recipes, its antioxidant, anti-inflammatory, and antimicrobial responses in the body can be further potentiated through the addition of other ingredients while still preserving the natural flavors of the papaya fruit. Fresh, ripe papaya. With endless possibilities for recipe ideas, deciding how to eat fresh, raw papaya requires just a bit of careful consideration. For one thing, its versatility makes it an ideal ingredient in many juices, smoothies, fruit salads, and sauces, where it is combined with medicinally-potent herbs and other healthful ingredients. Key compounds in papaya nutrition are vitamins A (from betacarotene), C (ascorcic acid), and E. Ripe papaya can be incorporated into fruit-flavored desserts as a way to obtain significant amounts of nutrients that may otherwise be lacking in conventional sweet treats. Moreover, carotenoids are highly prevalent in fresh, raw papaya fruits. These phytopigments, with their unique antioxidant properties, have been intimately associated with the prevention of major human illnesses, such as diabetes, cardiovascular disease, and cataracts. Green papaya. Among the many benefits of eating green papaya is that it contains high levels of the digestive enzyme papain, which helps to lower constipation and stomach irritation. With a mild flavor and relatively low sugar content, green papayas are prepared as other starchy vegetables. They also contain twice as many proteins and carbs as their ripe counterparts. For best results, sprinkle a bit of cayenne pepper into green papaya-based stews, pickled salads, and curry dishes. Eating green papaya this way will help to ensure all of its gastroprotective benefits. Papaya leaf. Many people don't realize that papaya leaves are more than just ornamental parts of the Carica papaya plant. They are in fact edible, and are often boiled to remove bitterness, or sautéed with other vegetables and seasonings. The papaya leaf contains carpaine, a chemical alkaline which has been shown to lower blood pressure and improve circulation in the body. Thus eating papaya leaves comes highly recommended for certain individuals at risk of developing heart disease. They also provide essential minerals, like iron, magnesium, zinc, and calcium. Papaya seeds. Eating raw papaya seeds along with the flesh of the fruit can help mask their bold, overpowering taste. 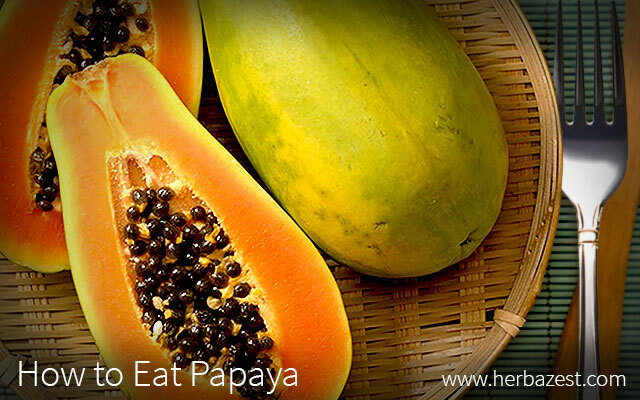 However, the best way to eat papaya seeds is to dry them and ground them into a powder. Their strong, peppery flavor is suitable for adding spice and variety to salad dressings, meats, poultry, and many other savory creations. Besides their heightened responses against free radical damage, papaya seeds also support the immune system and fight off infection. Eating papaya can help boost antibacterial action against strains of Staphylococcus aureus, Bacillus cereus, and Escherichia coli. Every part of the papaya fruit is significant, so deciding how to eat a papaya for health is all about personal preference. Because these scrumptious little fruits boast important medicinal actions in the body, eating papaya is the perfect way to meld flavor and nutrition. Purdue University, Papaya, Carica papaya L. | Carica papaya L.